Michael's therapist has challenged us to learn new games and words from foreign languages frequently. He learned Dominion this week and seems to enjoy it. LOL I like this one too. Krista buys LOTS of games, most her games, at thrift stores. I always get puzzles with 6 missing pieces or games with 30% of the parts missing...but I think I'll give it a try again. 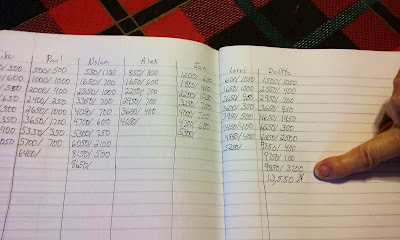 We play Farkle a lot with our immediate family and with Mom, Dad and Lorri. I had an EPIC WIN this week (I don't often win, I tend to take a few too many chances). I promised I would post a photo!